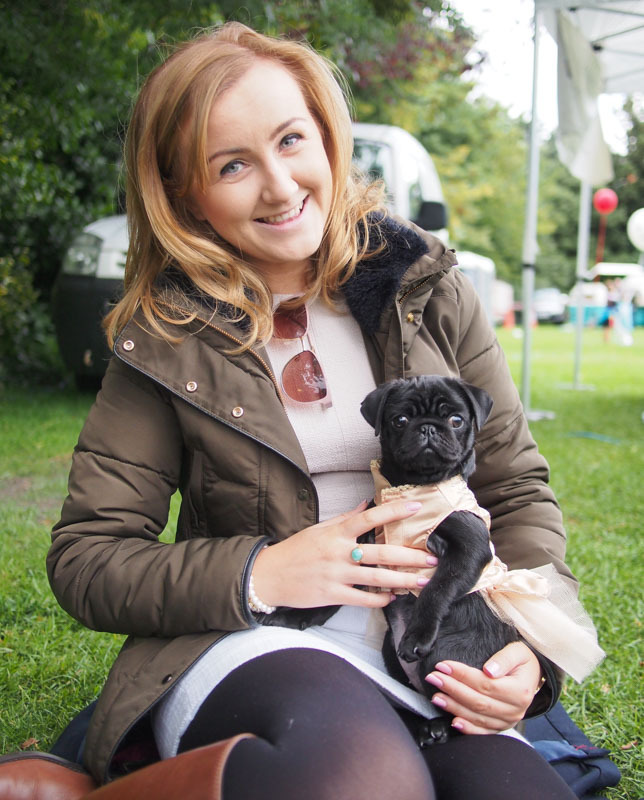 1000+ HUMANS - 400+ HOUNDS gathered at Merrion Square on September 12th 2015 to celebrate dogs. It was with enormous relief that we awoke to find blue skies on the the morning on the 12th following a night of biblical downpours. Merrion Square was looking spectacular when we arrived to build the site. Entrants for The Dog of Dublin were arriving from 1pm and our judges - Justine King (OPSH), Linda Conway (Stellar) and Rory O’Neill (Ms Panti) were busy with the pre-judging round. Their first job was to whittle down our 60-odd entrants to a short-list of 16 for the finals, on stage. It was a tough job with strong competition from a Huskie dressed as a dinosaur to a Lab (Frank) resplendent in princess garb. It was clear that a lot of love and creativity had gone into these sartorial confections. Meanwhile, down at the New Tricks Training Paddock, Ali Ramsey and her team where teaching the benefits of positive dog training. Have a look at her website and blog for great tips to help your dog (and you!) to be really well behaved and happy. The creators of the book our photographic exhibition was based on (‘In Dogs We Trust’) - Ollie Grove & Will Scott-Thomas joined organiser Michael McDermott on stage to talk about their work capturing fascinating portraits of dogs and their humans. From gang members to well known actors, their work reveals the transformative effect that dog-ownership has on humans. You can see more of their work here. Also on stage we had a great Q&A with Sinead Kelly, our resident vet for the day. She brought her best fur friend, Cleo, who took to the stage like an old pro. Ali Ramsey and the team also demonstrated why positive training works - on a group of human volunteers. Kudos to them for sacrificing their dignity in the name of education! Throughout the day we had the heats of The Dog of Dublin competition. The sixteen finalists were introduced and interviewed by our wonderful host - Darren Kennedy. We saw a fantastic mix of mutts and breeds, little and large - each one a star. Devlin sported a Superman costume while his best fur friend Luke wore a tiny Spiderman get-up. Lola the baby pug wore some beautiful jewellery but the stage-fright got to her so Megan carried her up and down the ‘dog-walk’ instead. Wurzil wore a tux and made the cover of the Sunday Times the next morning! Owners told us all sorts of stories about their dogs. Finally it was time to make the awards. Darren collected the judges decisions and we welcomed Lucky the hot-dog with Holly and Joao on-stage as the 2nd runners up. Lucky started life in The Czech Republic and made a long journey to Ireland by land and sea as Holly couldn’t bear to have Lucky travel all alone on a cargo plane. Next up, in 1st runner up position, was the amazing dog-apillar Tippi, with her human, Caitriona. Tippi’s super costume was hand-made by Caitriona. She told us that her nephew has no socks left, but it was totally worth it! The very VERY popular winner of the top title - The Dog of Dublin 2015’ was Missi. This brave little survivor was rescued by Vivien who has given this thirteen year old a whole new lease of life. Missi has arthritis so Vivien bought a buggy to help her get around. Their Moulin Rouge themed costumes and the charisma and spirit of Missi won the hearts of the judges and audience alike. On a more serious note, we were proud to support the wonderful work of Dogs Trust Ireland. Their pledge team played a blinder on the day. We look forward to strengthening our relationship for next year’s event. Rounding off the day the classic ‘Lady & the Tramp’ was screening on the amazing Happenings pop-up cinema screen. Even though the rain started to come down again at the opening titles, we were still enjoying the glow of a happy doggie day out. We met so many wonderful dogs and their friends and can’t wait to do it all again next year, with more events, more fun, and more dogs! THE DOGGIE DO WILL RETURN IN 2016 - sign-up for our (P)update Newsletter and we'll keep you in the loop.